Happy Monday! I admit, it's been a long couple of weeks and I desparately needed just a little "me" time this weekend. My husband graciously blessed me with a few hours to myself and I jumped on the chance to doing some window shopping. I walked into J.Crew and saw the dress that I've been conveting the past week ever since I saw it here. It was on sale AND in my size so I took it as a sign and snatched it up! I can even fit it over my belly and post-baby, I'll be able to wear it with a belt for a long time. Yes, include me among the countless bloggers you'll read about who LOVE J.Crew. What I love about their style is that it is classic, timeless, but in a updated, fresh and quirky way. There's always something unexpected about their looks whether it's a bold, but beautiful color, or an new mix of patterns or textures, like denim with glitter or hot pink and orange. I first came across this these photos in January and knew that I'd want to share them again someday. 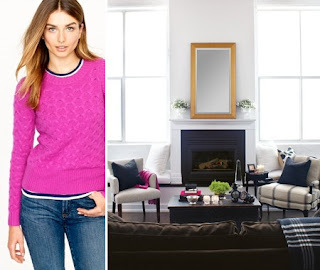 Click here for a link to all 10 J.Crew inspired rooms. I'd consider all these rooms classics that won't go out of style, yet, there's nothing boring or predictable about them. There's something in each look that makes you say "hmmm" :) Thanks Jenna Lyons! We love you! What about you... do these looks speak to you too?